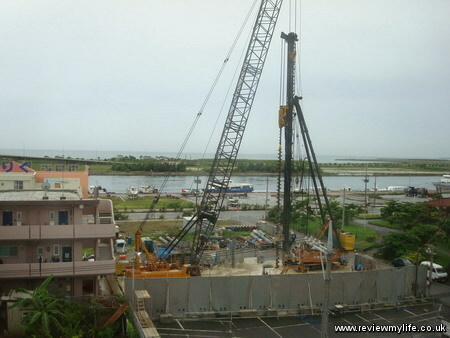 Here are some photos of the three hotels we recently stayed at when we visited Naha and Ishigaki (both part of Okinawa). 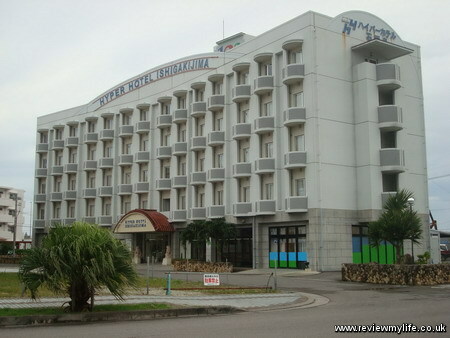 First up the Hyper Hotel Ishigakijima which is near the sea and the main city of Ishigaki. It is about 15-20 minutes from the airport by bus. No English was spoken on check in and the man insisted on seeing both of our alien registration cards (normally Japanese hotels only want the ID of the person whose name is on the booking). 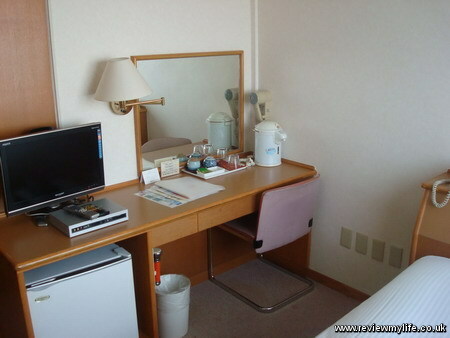 The rooms were clean and functional in a business hotel style with most of the usual hotel items. No fridge though. 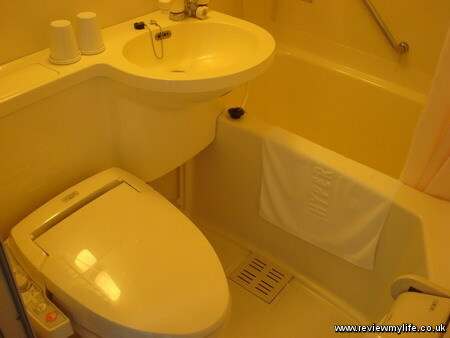 The bathroom was very generic with a usual Japanese electronic toilet, shower and bath. Free internet is available if you bring your own computer and LAN cable. We got a room that faced the sea, but due to building works taking place across the road the view was less than sensational. A basic breakfast of bread, and rice balls was included in the dining area on the ground floor of the hotel. The hotel also has a coin laundry, very useful if you are travelling light. Hostel Burney’s Breakfast was an interesting place. As it was a hostel the rooms were cheaper than staying in a hotel, but they were small. The room was almost exactly the same size as two mattresses. On one end of the room an old mattress placed on the floor touched three sides of the room. On the other side of the room was some modern looking lights and a computer. The place also has free WiFi if you bring your own computer. The guy who was running the place was friendly, and spoke much better English than at most of the hotels we’d stayed at on this holiday. The check-in was very quick, and he didn’t seem bothered about seeing our IDs. Instead of being numbered the rooms had letters. Some of the electrical, plumbing and building work in this hostel looked very DIY! See the electrical connection on the ceiling in the photo on the left. 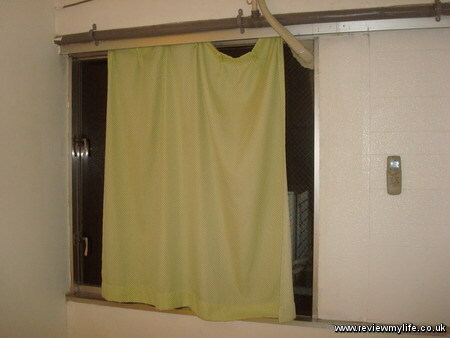 Also in the room the curtain didn’t extend across the window. At least there was air conditioning. You can see where someone has filled in the gap in the window where the air conditioning pipe goes outside. 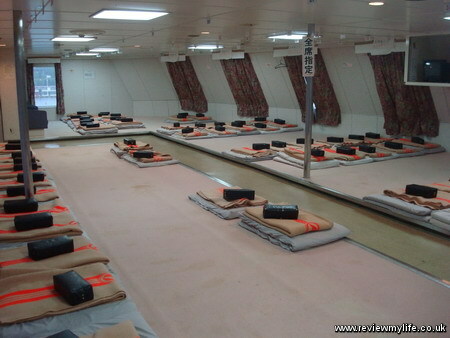 As well as private rooms they have a capsule sleeping area, presumably even cheaper. 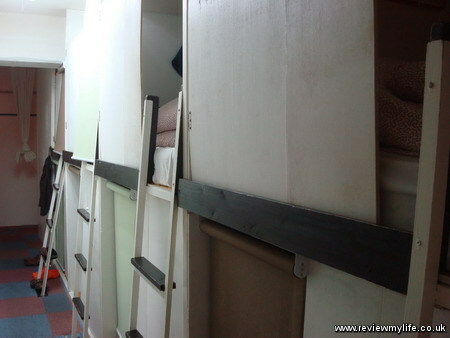 There was a shared toilet and shower area, and laundry facilities were available too. This place is fine if you want somewhere cheap and want to be able to meet other travellers, but if you want something more luxurious you’ll need to pay more. The Hotel Rasso Naha Tomari is another generic business looking hotel. The staff spoke no English, but we managed to check in with a little Japanese. 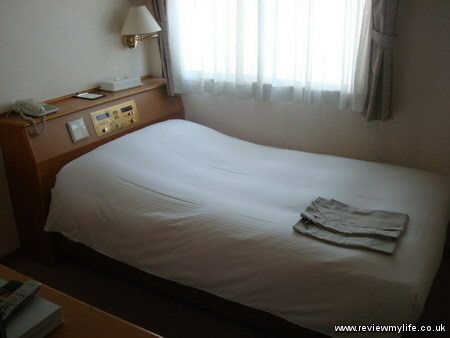 The Hotel Rasso Naha Tomari is about 15 minutes walk from the Kokusai dori, and near to the port area for visiting Tokashiki Island. Be aware that there are quite a few Hotel Rassos in the area, so make sure you find the correct one. The rooms are smart and clean with free internet. There was no view, so the window served only to let in light. They had a breakfast in their dining room downstairs of rice balls and bread. But get there early, once the breakfast runs out they won’t bring more! 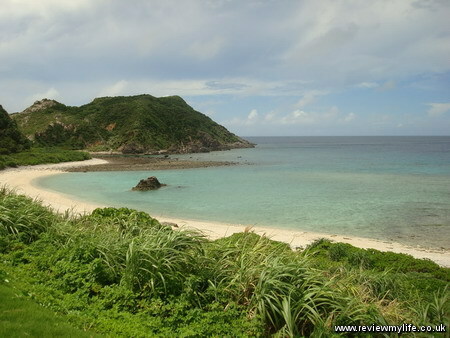 Tokashiki Island is one of the Kerama Islands off the coast of Naha, Okinawa. 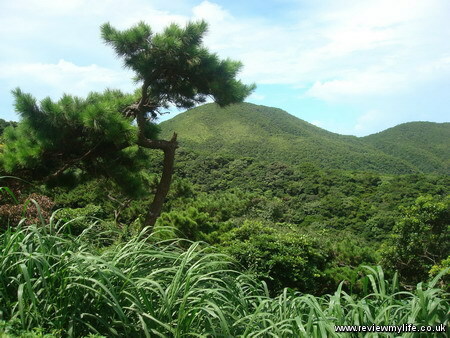 If you are visiting Naha and have seen the main attractions Tokashiki Island makes a good day trip away. 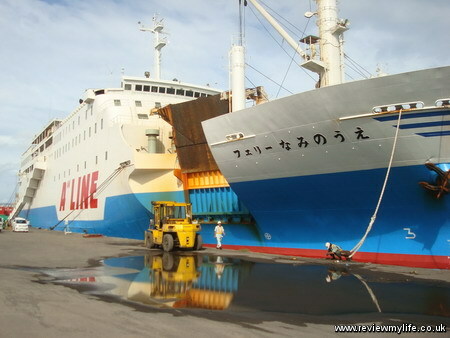 There are two ferries that will get you to Tokashiki from Tomari Port in Naha city. There is a slow ferry that takes about 70 minutes, and a fast one that takes 35 minutes. You buy your tickets from the building with the green wavy roof. 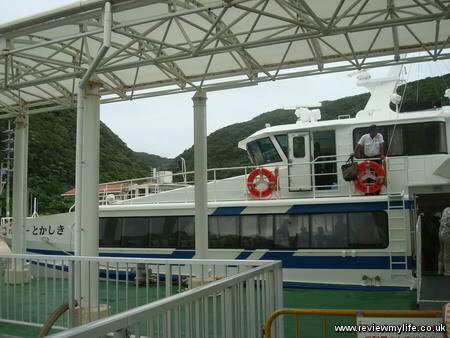 At the time of writing the fast ferry for adults was ¥4620 return, and the slow ferry was ¥3080 return. For most of the year there is a single boat of each that can take you to Tokashiki Island in the morning, and take you back to Naha in the late afternoon / early evening. The fast ferry gets you nearly eight hours on the island, and the slow ferry gets you nearly five. If you miss your ferry back then you might be stuck on the island for the night! 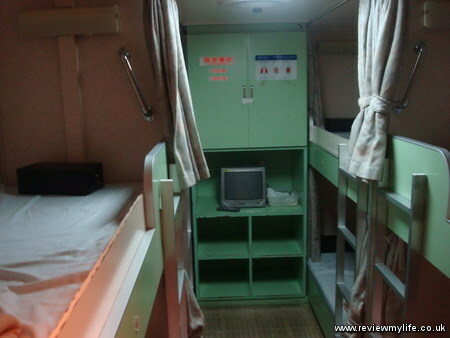 Here is the fast ferry (Marine Liner Tokashiki Express) from the inside and outside. 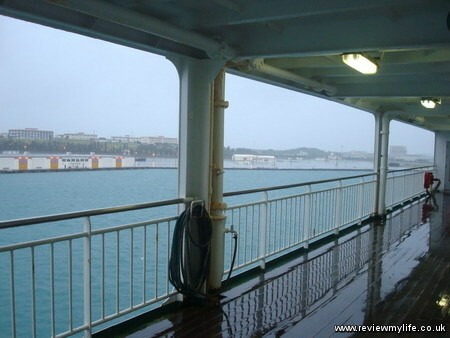 There is an upper deck as well where you can feel the sea breeze as the boat bounces along (and it does bounce if the sea is anything but still!). If you really want to see the island you might want to hire a car. On arrival at the Tokashiki port we found a man at the tourist counter in the ferry building who pointed us to the car hire place. We had to go round the building, up some stairs, and into a bar / restaurant. This is where they do the car hire! Our car cost us ¥4725 for 6 hours, plus ¥1050 for insurance, plus we would need to pay ¥800 minimum for the petrol when we got back. They took the mileage before we left and if we drove more than a certain amount we’d have to pay extra. The car was very small, but you don’t want a big car here. The roads are narrow, winding, and hilly. But if you want to see the whole island rather than just visiting a single beach a hire car is the way to go. We wanted to go snorkelling so we made our way to Aharen Beach. We didn’t have any kind of map other than what was in the tourist leaflet, but using that and a compass we managed to find the beach after a few wrong turns. We parked the car in a quiet grassy square that had other cars parked on it and walked to the beach. We needed a coin locker and fortunately by the beach is a small camping ground. There you can use a locker for ¥300. There are also showers and an area where you can change. A few of the people around the camp site seemed a little odd; they were gawking at us as if they’d never seen a foreigner before – reminded me of The League of Gentlemen. Hiring the snorkelling equipment was straight forward. There was a proper stall near the beach where a snorkel, goggles, and flippers could be hired for ¥1000 per set. After changing and locking our clothes and bags in the coin locker we spent about two hours swimming and snorkelling. They is some good coral in the roped off swimming area, as well as yellow, purple and other multi-coloured fish. My camera isn’t water proof so I didn’t get any photos of this area, other than these two looking back down the street with the snorkel hire through the rained on car window as we left. We spent several more hours driving all around the island. By the time we were done we must have driven over most of the island’s roads – it isn’t very big. There are other things to do on the island (parks, observation points). And in January to March you can get another boat to allow you to whale watch. But we were more interested in having a drive and admiring the scenery. It is very green inland and very blue out to sea. Just before our 6 hours was up we returned the car. There was no extra petrol charge as we were within our mileage. Then we had a drink, before getting the boat back to Naha. 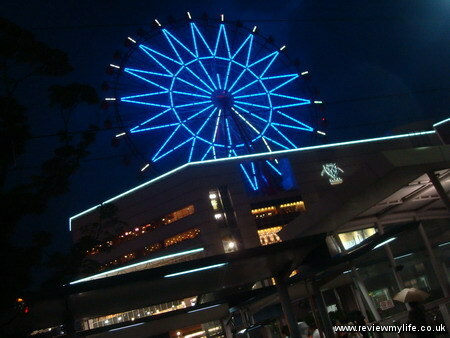 A good daytrip, and something fun to do if you want to go somewhere quieter than Naha. 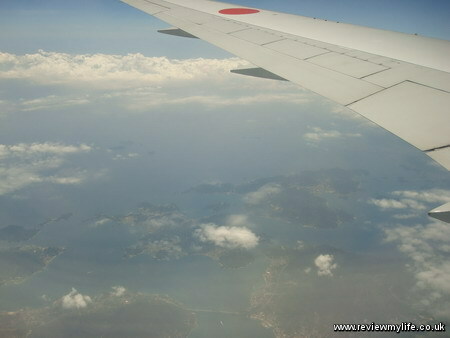 After flying from Takamatsu Airport we arrived at Naha Airport and got the monorail to the city. We had three full days, staying at two hotels; the Hotel Rasso Naha Tomari and Hostel Burney’s Breakfast (more about them in a future post). 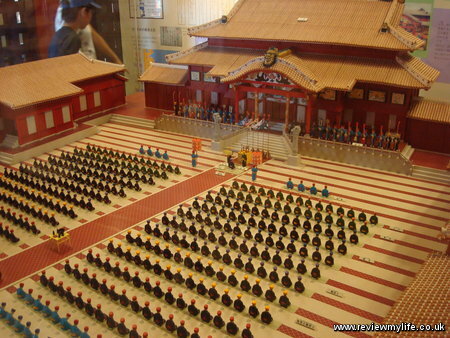 Shuri Castle is one of the main attractions in Naha city. The entrance is about a 15 minute walk from the last stop on the tram. It was destroyed during World War II but much has now been rebuilt. More rebuilding is still on-going. There are steps in and around the castle so on a hot 33/34 celsius day it is tiring! You can probably spend about an hour here if you take your time. 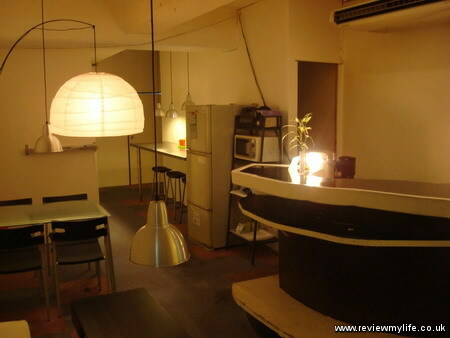 There is a café and restaurant area where you can fill up before moving on. At the other end of the city is the Fujushu-en Chinese Garden. It is free to enter and you can spend a pleasant half an hour looking at the plants, flowers, statues and water features. The former Japanese Navy underground headquarters saw action during World War II. The tunnels have now been renovated and opened. Getting there is a bit of a mission as the entrance is on top of a hill. You might want to get a taxi here and back. There is a museum in which there are exhibits (in English) about the tunnels and Rear Admiral Minoru Ota who along with six other officers killed themselves near the end of the war. The museum is good but I thought they should have given a proper explanation of how Japan entered the war to put the events in these tunnels into context. The tunnels themselves are very interesting. They were dug by hand using pick axes. You can see where the soldiers lived and worked. They are fairly bare but there are some pictures on the walls to help you imagine what they are like. 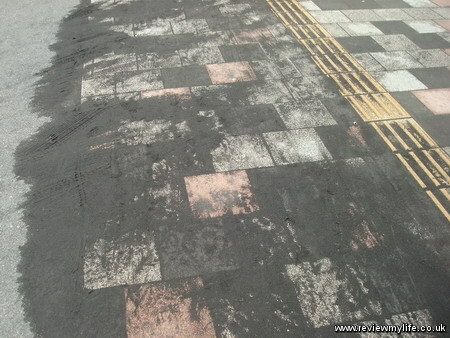 The photo below right shows some of the damage done by a hand grenade. If you are going to the Ocean Expo Park and are a fan of pineapples you might want to visit Pineapple Park which is close by. At Pineapple Park is a ride which takes you round a pineapple plantation with commentary (there is English audio available). There are some exhibits about pineapples (and also about sea shells for some reason!). Then there is a large shopping area where you can buy all kinds of pineapple cakes, sweets, wines, and drinks. Along the way you can eat various pineapple foods. They say that you can have ‘all the pineapples you can eat’ but they give the pineapple chunks, cakes and drinks to you in very small portions, so you aren’t likely to overdose on them! This is a fun stop off on the way to the Ocean Expo Park, and children will like it. 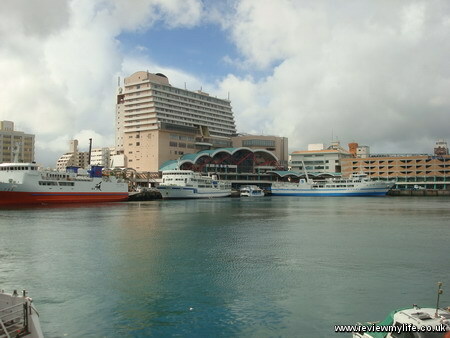 The Ocean Expo Park is at the North end of Naha. It has an aquarium, beach, museums, and gardens. It is a long way from Naha city (1.5-2 hours) and the different areas in the park are some distance away from each other. 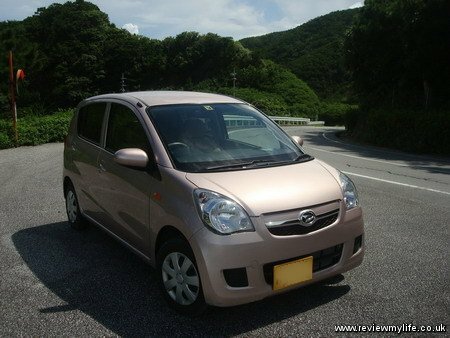 The best way to visit it from Naha city is to hire a car and drive there. 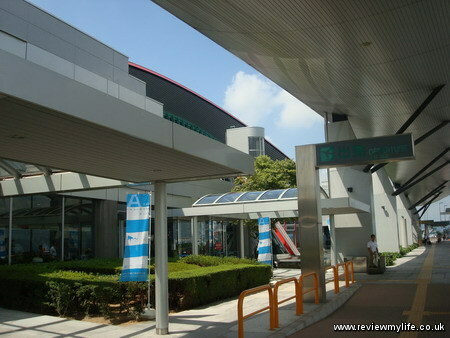 In the Ocean Expo Park is the large Okinawa Churaumi Aquarium. 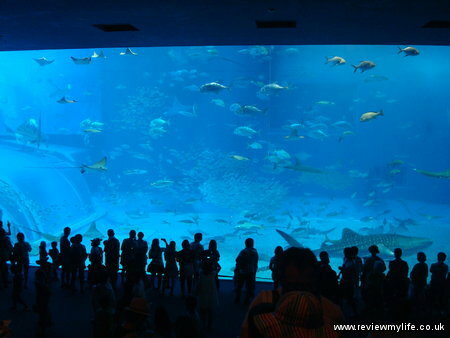 It is a modern and well designed aquarium with all the kinds of fish and sea creatures you’d expect at an aquarium of this scale. One of the highlights is the huge 7500m³ Kuroshio Tank which has hundreds of fish, whale sharks and mantas. 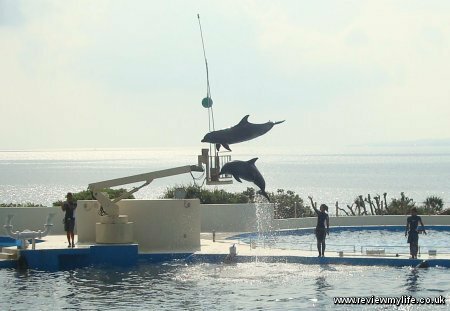 Close to the aquarium is the dolphin theatre where you can see regular shows. The dolphin theatre if free to enter, so you don’t have to get a ticket to the aquarium to see them. The Tropical Dream Center is a botanical garden in the Ocean Expo Park. You get a discount on entry if you have visited the aquarium. They have many green houses containing tropical flowers and plants. There were a large number of tropical fruits when we went there. There is a building (below, left) that you can go up to get a good aerial view of the park and the sea. The Kokusai dori and Heiwa dori (dori just means street btw) are good places to spend a few hours. Kokusai dori is a big shopping and restaurant street which is busy during the day, and which becomes more lively at night. It is a good place to go for food in the evenings. 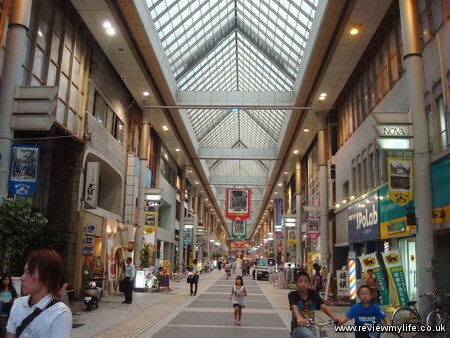 The Heiwa dori (in the photo above) is a big covered shopping area selling cheap clothes, trinkets and other goods. At the end of the Heiwa dori is the old pottery area. This is what we did on our three full days in Naha. Day 1 – Shuri Castle, underground navy base, Chinese garden. Day 2 – Pineapple Park and the Ocean Expo Park (Churaumi Aquarium and Tropical Dream Center). We rented a car for this day. Day 3 – Visited Tokashiki Island. More about this island in a future post. Evenings – Kokusai dori and Heiwa dori. 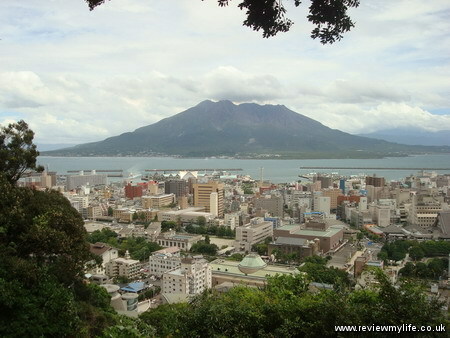 If you are on Shikoku Island and want to fly to Tokyo, Seoul, Naha (Okinawa) or Kagoshima then you might find yourself using Takamatsu Airport. There is no train there so you’ll either have to get a taxi or the bus. 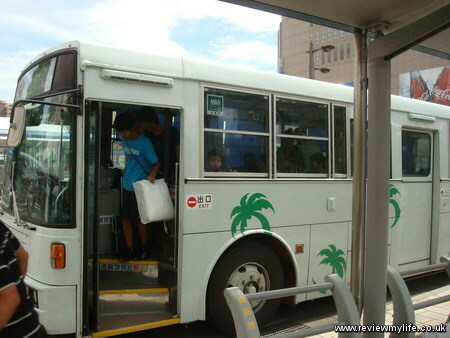 The Takamatsu Airport Limousine Bus costs ¥690 from Kawaramachi station and departs from stop 2. 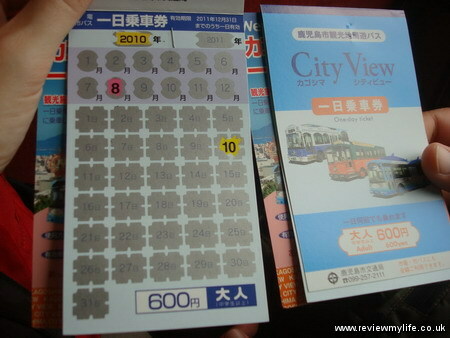 You can buy the ticket from the booth near the bus stop, or just buy it from the driver. Above is what the bus looks like from the outside and inside. And on the right is what the tickets look like. 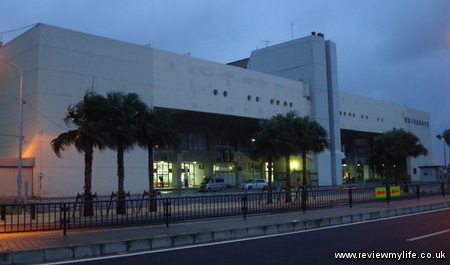 Here is the outside of Takamatsu Airport when you arrive there by bus. 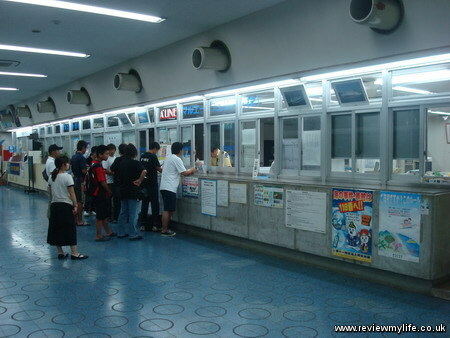 It was very busy when we got there (school holidays) so we used an ANA automated check in machine. We just had to scan the bar code of the receipt (we’d booked via the Japanese KNT travel agent), confirm our seats, and the tickets came out. 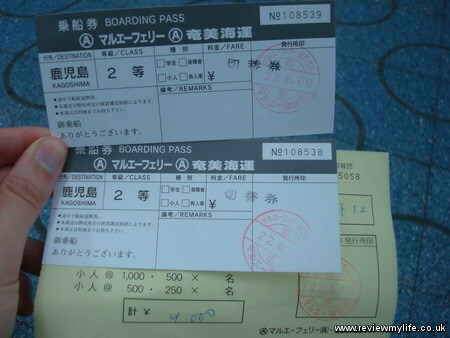 As this was a Japanese domestic flight there was no need to show anyone our passports, or alien registration cards. Note – The ANA check-in machines have an English option, but the JAL ones don’t! We still had over an hour before our flight so we explored the airport. 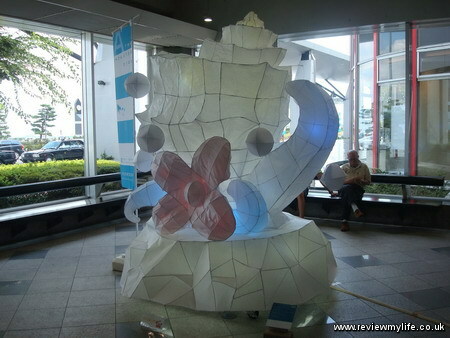 In the lounge we found this artwork which is part of the Setouchi International Art Festival. 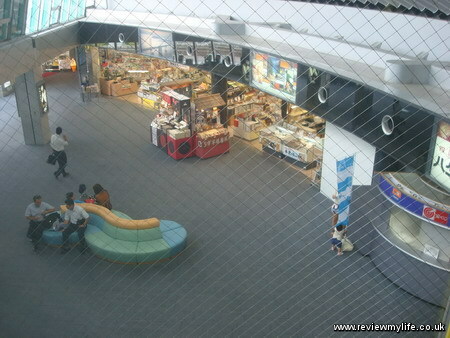 On the way to the plane viewing platform you can see the airport shops from above. If you want to go into the plane viewing area you need to pay ¥100, but it hardly seems worth it as there are so few planes at this airport! Here is another shot of the viewing area, and you can see the large Takamatsu sign from the back. No planes though! Security was very simple. There was no queue, they just put the bags through the X-ray, and we walked though the metal detector. 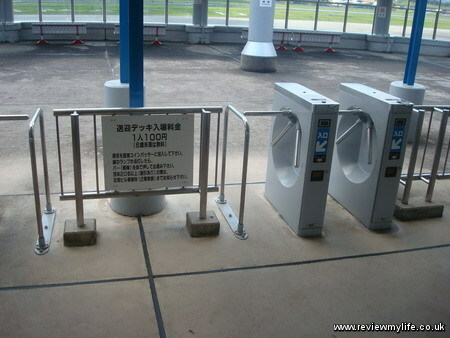 At the time we flew (August 2010) there were no restrictions on bringing liquids onto domestic Japanese flights. This is much more civilised than the usual Western system of only allowing 100ml containers onto the flights, and making you give up your water before you go air-side. On the left is what it looks air-side. Just rows of seats, and a few tiny shops. They also have phones on the windows so that you can say good bye to any relatives who are on the other side. Right on time we were able to get onto the plane and fly off to Naha, Okinawa.